Company is coming this weekend for the game. Y'all know what that means. Lots of cleaning and straightening, and finishing up last minute things I've been putting off. I'd been looking for a shower curtain for the boys' bathroom for a while. The shower has doors, so a curtain isn't mandatory, but it will make the room look complete and hide the tub when it's not "company ready." The theme of the bathroom is Alabama football--white, crimson, and gray. The curtain I originally liked is this one from Bed, Bath, and Beyond. It's cloth and has a waffle pattern. Really pretty and substantial. It's $40.00. I wasn't crazy about the rods they had, so I headed to Lowe's. 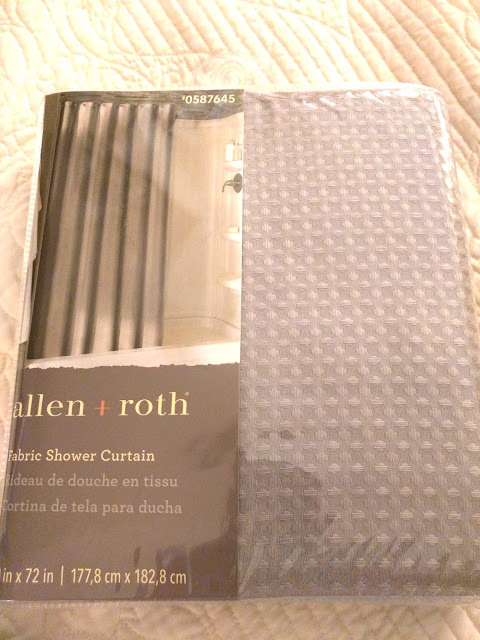 The Allen + Roth material isn't as heavy at the Escondido from Bed, Bath, and Beyond, but it's the look I was going for and the price is right. It also comes in white and cream if you could use one, too! What do you think? Is the look close enough to "buy it for less?" Definitely! I like this for a boys bathroom! Thanks! It turned out just fine.